Most people experience significant pain at some time in their lives – whether from an injury, illness, or an unknown cause. Pain is a normal, human experience. Without the ability to experience pain, humans would not survive. Living in pain however, is not normal. In the last several years, our knowledge of how pain works has increased considerably. In many persistent pain states, focus has been shifted to the nervous system and how the brain processes information from the body and the environment. This is for all pain, regardless of where it is in the body and how long it has been going on. The latest research shows that the more you know about pain and how it works, the better off you’ll be. This includes moving and functioning better, experiencing less pain and having an increased ability and interest in doing more healthy exercise and movement. This knowledge is essential in your recovery. What can you do? Which treatment is right for you? Often times, people suffering from pain take medication to dull the pain. Taking medication is understandable when pain is constant and unbearable. It may be helpful to dull the symptoms for a short period of time, but it won’t get at the root of the problem and correct it. It’s like hitting the snooze button on an alarm. Unless the cause of the pain is treated, your body will keep sounding the alarm and reminding you that something is out of balance. Eventually, the pain may get worse or become chronic. It is also possible for the medications to cause unwanted side effects and further compromise your health. Surgery may be another option. At times, this approach may make sense, but it could be both expensive and risky and there is no guarantee that it will be effective. Acupuncture is a time-tested, safe, effective, natural and drug-free way to eliminate pain. Unlike other methods of handling pain, there are side effects. The World Health Organization (WHO) and the National Institutes of health (NIH) acknowledge the benefits of acupuncture in treating and eliminating pain due to a wide range of causes. Pain is individualized, which makes it so hard to treat. You need treatment tailored to your pain. Acupuncture and Traditional Chinese Medicine (TCM) offer a safe and effective approach to relieving headache pain, without causing harmful side effects, and incorporate a comprehensive diagnostic protocol that can help your acupuncturist understand and address the root cause(s) of your headaches. Understanding headache types. There are many factors in TCM theory that may play a key role in the root cause(s) of a headache. These include body constitution, emotional health, excessive work, social and exercise activities, improper diet, physical trauma and hormones. Headaches can also be diagnosed according to specific symptoms, times of occurrence, location on the body, type of pain, triggers and remedies which provide relief. A natural path to relief. Acupuncture and TCM takes a holistic, or whole-body approach to health. Your practitioner will also attempt to determine what root cause(s) are contributing to the overall problem. By identifying and treating the underlying cause(s), not just the symptoms, he/she can apply the most effective care. You settle into a warm, comfortable bed, close your eyes and nothing happens, you just can’t fall asleep. Hours go by and still you’re awake, The next day you feel tired, grouchy and are unable to focus. Does this sound familiar? How acupuncture can help: According to the theories of acupuncture and Traditional Chinese Medicine (TCM), conditions such as insomnia are a sign of an imbalance in Qi (pronounced “chee”), the vital energy that animates the body and protects it from illness. The treatment of infertility with acupuncture and Chinese medicine dates back 2,000 years. These ancient, time-tested techniques improve fertility rates and support a woman’s whole body, unlocking unlimited potential for health, healing and childbearing. Acupuncture and Chinese medicine can raise the fertility potential for women by affecting the quality, quantity, balance and flow of Qi (nerves) and blood. When these are circulating freely throughout the body, every cell, tissue and organ is properly nourished and functioning well. Acupuncture and Chinese medicine understand that symptoms and signs are merely indications of an imbalance deep within the body. This 5,000 year-old healing art focuses upon correcting underlying imbalances that have occurred over the years. These imbalances, if left unchecked, will result in a variety of symptoms and signs normally associated with a Western diagnosis of menopause. 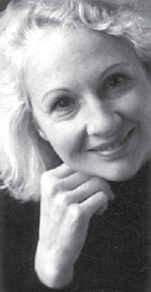 Acupuncture and a woman’s natural process. Menopause signifies “a change” within a woman’s life. This change occurs because a woman’s body chemistry is shifting. Chinese medicine recognizes this chemistry change as a natural process’. As we age, our supply of Jing Qi energy is slowly drained. Generally, Jing Qi naturally begins to decline between the ages of 35 to 60, although some people drain it faster than others. When Jing Qi declines, the Organ Systems within our body become unbalanced. This leads to various symptoms and signs, such as graying hair, loss of libido, weakness of knees, urinary difficulty, poor memory, backache and fatigue. Allergies, seasonal or year round, are an ongoing problem for many individuals. 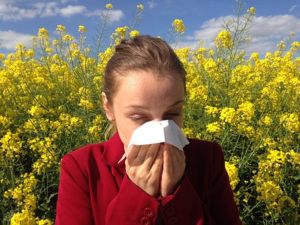 Seasonal allergies typically affect people during a particular season or time of year. They are also referred to as outdoor allergies and are generally triggered by tree, grass and weed pollens or outdoor mold spores. Year round allergies also known as indoor allergies are typically brought on by animal dander, dust mites, mold spores or insect allergens. There are also food allergies, which occur as a result of eating a cuprit food, and can also create physical and/or emotional symptoms such as body hives, swelling, itching or redness of the skin, depression and/or moodiness. No matter what kind of allergy you suffer from, environmental or food related, acupuncture can provide needed relief. While medications (over-the-counter or prescribed) often come with unwanted side-effects, acupuncture does not. This makes acupuncture an appealing option for people looking for a new way to combat allergies. According to Chinese medical theory, the symptoms and signs that indicate a Western diagnosis of allergies, relate to imbalances in the organs systems of the body. These imbalances may stem from a variety of causes, including stress, poor diet, foods that don’t agree with your body, pollutants and environmental toxins. Over time, if imbalances remain within the body, they will affect the functioning of the organ systems. 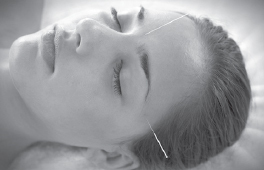 Acupuncture treatments may be combined with herbs, dietary changes and/or nutraceuticals. These therapies accelerate the healing process in order to balance, build and support the health and functioning of your body’s systems.